One of my favourite things about conventions is finding something you’ve never seen or even heard of before. I came across this gem at Origins, and while I was a little put off by the price the art quickly tipped me over into all my usual excuses to buy something I knew I wanted to pick up as soon as I’d seen it. There are a lot of games trying to tell you they are ‘different from anything you’ve seen before’ and more often than not it only proves how limited the authors’ experience is. However, Emberwind genuinely has some intriguing features that make it stand out as something very different. Essentially, Emberwind: The Skies of Axia is a standalone adventure that comes complete with its own system and characters ready to play. This seems to be a growing trend these days, with products like Alas Vegas and Cthulhu Confidential answering a demand for pick up and play adventures with enough bite to last more than one session. However, where Emberwind differs is that it works on three different levels of potential play. Firstly the adventure can be played as a solo adventure. 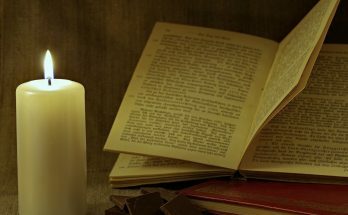 You can read the sections, make decisions and turn to the next page for the resolution of the scene as you might in a Fighting Fantasy gamebook. The second method of play is running it as a ‘solo adventure’, but as a group. All of you pick a character and take it in turns to read the sections making any decisions by group vote. 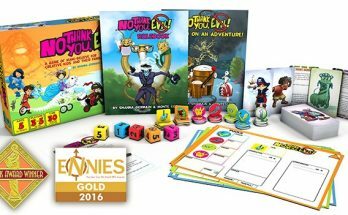 Finally, it can be played just like any standard tabletop adventure with a Gamemaster reading the book and possibly embellishing and adapting the adventure as they go. 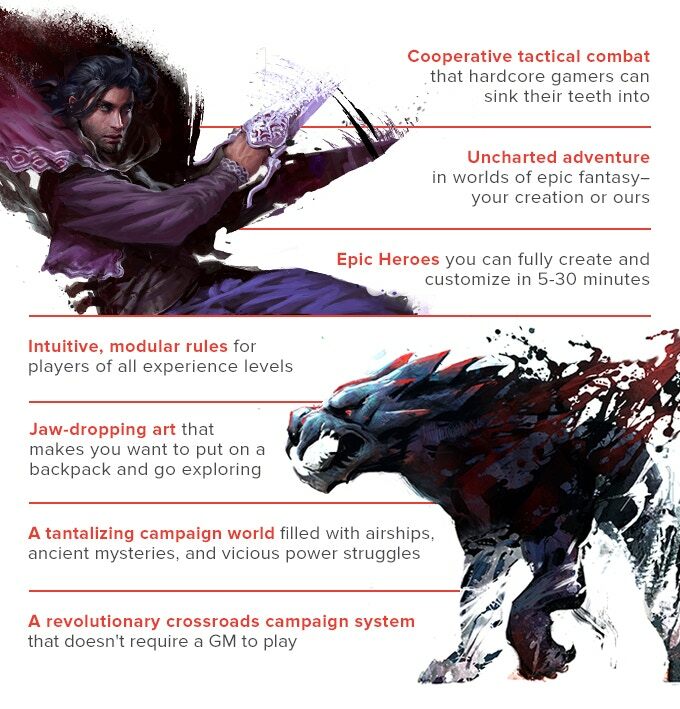 The combination is a nice bonus to anyone looking to run it the more traditional way, with the option to enjoy it as a solo adventure before running it for your group. So, how does it work? Well, for the most part, it works the way you’d expect. Read the scene setting text, make a decision from the options (or win a combat) and turn to the correct page for the outcome (which is not always ‘you are dead’ for losing a fight). However, this is not done by narrating each step, instead whole scenes are described, usually offering several options, rather than asking you which door to take next. If you are playing as a group you might have to vote for the path the party takes which just needs a majority. The other nice tweak is the campaign clock. There are some locations or actions you can opt to investigate that add time to the adventure, like taking a look at each of the stalls in a bazaar. These actions add a point to the running total of ‘campaign clock’. At certain points in the adventure, you may be asked what the point total of the campaign clock is to know if you are too late for something. As you don’t know what number you are aiming for and when it will be a factor you need to be careful how often you decide to stick around any particular place. But it does allow you to explore the world without losing track of the main plot. That pretty much covers everything except combat, where things get a little more involved. The authors could have just opted for giving opponents a combat score and hit points and just taking it from there. But instead, the game allows for full tactical combat with a neat system for choosing the opponents’ actions. Each foe has a grid containing all their possible actions, usually attack, move and use special ability for the most part. You start with a random roll to determine the start point and follow the arrows in the grid for its action each turn. This means you run a combat as involved as most tabletop games with monsters capable of throwing you a curveball. This does mean there are a lot of special abilities and conditions you might apply. But they are all very clearly labelled and detailed so it moves very smoothly. So, that’s the system but what about the game? While this is a single adventure, the writers give you a lot of background on the world of Emberwind to really make the place live. This detail is actually very succinct and gives you what you need to know exceptionally quickly and efficiently without turning it into dry exposition. There is enough there to simply read out the setting to everyone before you start and still have plenty of time to enjoy the adventure. The world of Emberwind is set on a series of floating islands that are kept aloft by magical crystals. These islands are the only places for people to live on as the ground below is covered in a thick ‘miasma’ that is horrifically poisonous to anyone who gets near it. Luckily these crystals can also protect you from the miasma to a certain degree. However, that’s the problem. In one of the poorest districts in the player characters’ floating island, folk have been chipping away bits of their crystal to sell or protect them from the growing miasma. As a result, this whole section of the island is close to falling out of the sky! So the adventure involves a mission to find a replacement crystal. The four player characters will have to find a way to secretly leave the island and set out to follow a lead, which will take them to some pretty surprising places. I can’t really say more than that, without spoilering the adventure. However, I found it engaging and intriguing with a world background that still came alive due to the extra details in each encounter and scene. This is no generic fantasy but a world with its own rich setting. As such, if I have any complains it is that I wanted to know more about Axia! What may draw you to the game (as it did me) is the art. This is a lavish book and while it may be a little expensive you can see where the money went. Each premade player character gets a full picture and description, and a lot of their background and skills are specifically useful in sections of the adventure. You have Rook the soldier, Laureat the academic, Rath the rogue and Piper the noble. They are all well put together and each comes with several different options for their skills and abilities to pick from. The upside/downside in this regard is that their stats are not detailed in the book. 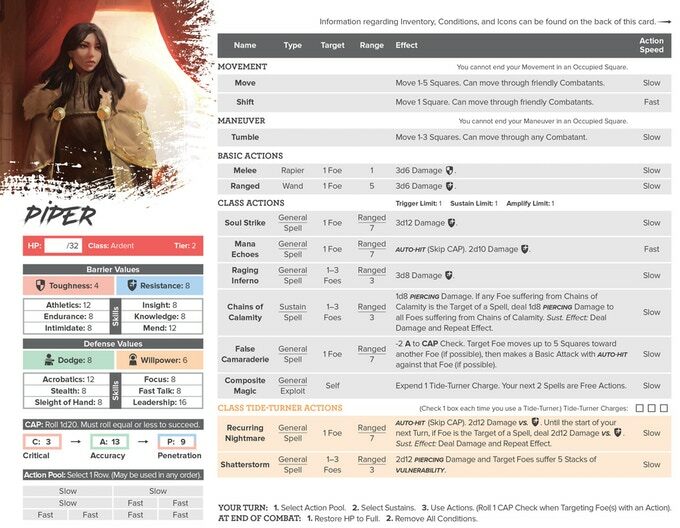 Instead you need to download the free pdf from the website that offers not only that but stats and floor plans for all the combat encounters. 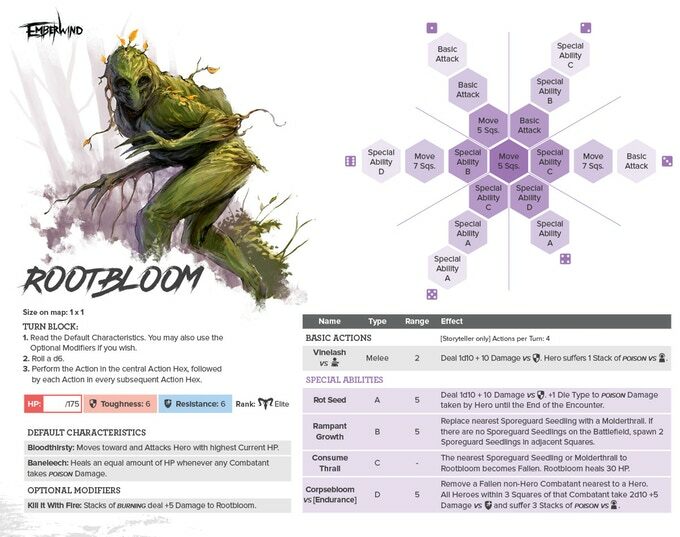 Offering them free to print out is a really sound idea, but my old school knee jerk reaction wanted to see them in the book too for the GM to reference (although the monster stats and maps are). That’s about all I can tell you without ruining the plot, but it is well worth a look. The adventure breaks down into three acts and an epilogue. I think most groups would take 2-3 sessions to play through it, although an exceptionally fast group might manage it in one long session. However, you should want to take your time with this, as it is worth reading each section and enjoying the world without trying to rush past to ‘do the adventure’. If I have any problems with the game it is that some parts of the combat system could be simpler, but I wouldn’t call it especially complex either. Your milage may vary on whether you like simple or complex game rules. I prefer simple, but there was nothing here to put me off playing it, and where there are complexities it is usually only to ensure clarity when you have no GM to make a call. The only other issue is that I enjoyed the world so much I wanted more! It is a little frustrating to not have all the detail to just carry on the adventure (although there are several story seeds to you can move on to depending on how it ends). Luckily, there is a Kickstarter running (but only 6 days left as I write this!) for a core rulebook that should offer all you need for more adventures in Emberwind. I thoroughly advise you to check it out. EMBERWIND: a new breed of tabletop RPG Kickstarter ends on Sunday, December 16 2018 11:59 PM EST. You can find it here. Andrew Peregrine has worked in RPGs for over ten years with several companies, including AEG (Seventh Sea), Cubicle 7 (Victoriana, Doctor Who, Airship Pirates) Eden Studios (Buffy/Angel), Margaret Weis Productions (Serenity, Leverage) and White Wolf (Changeling & V20). He also writes games under his own imprint ‘Corone Design‘. For a real job he works at the Theatre Royal Haymarket as a Lighting technician. He lives in London with his partner Claire, and owns no cats.